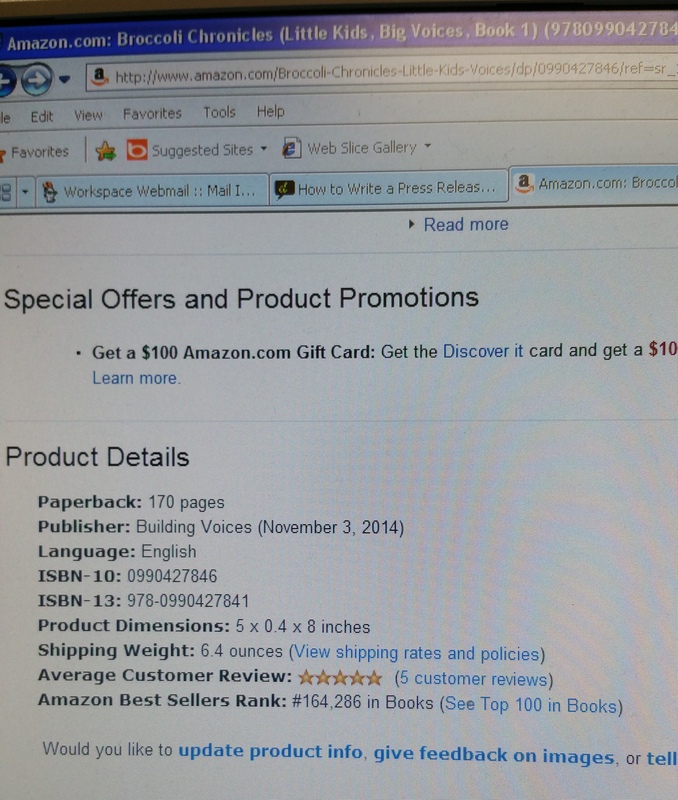 Utilizing your Amazon Author Page is one major benefit for self-publishers. Items such as: product details, more about the author, and customer review sections allow you to provide in-depth information about you and your book. Let’s take a look at the product details section for Broccoli Chronicles. Keep in mind, this is an old caption and therefore this section has been recently updated. This section allows you to see the page count, the publisher, the dimensions of the book, and more. Unfortunately, it’s not shown in this picture, but I later added the age range for my book which lets parents know whether or not the book is appropriate for their child. If their child is 3 years old and is still reading picture books, then a chapter book designed for ages 7 – 12 is not appropriate for them. You are also able to see how many customer reviews there are plus my best sellers ranking which informs you of which position my book is at compared to the 8 million plus books that are on Amazon. Check out this link to an Amazon Author Page Q & A. If you still have questions, check out this list of product detail page rules created by Amazon.